Over/Under: Under 157.0 at 1.90 Bet Now! While there are plenty of Euroleague games that have a lot to offer this week, this is one of the few that really has something at stake. The away side come into this game with their Euroleague playoff destiny in their own hands and if the Turkish side wins their two remaining regular season games, they will be involved with the playoffs. Of course, that may be easier said than done and the Istanbul side will definitely not find things easy in Germany against a Bamberg side who have been going out fighting. 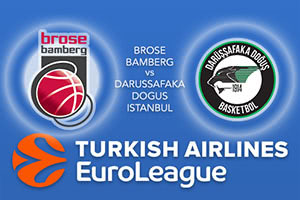 Brose Bamberg are out of the running when it comes to the Euroleague playoffs but they have won their last two games on the road. As this is the German’s final home game of the season, they will look to put on a positive display for their fans and this is the factor that could make life very difficult for Darussafaka on Thursday night. In the earlier meeting between these sides this season, it was the Turkish team that triumphed on home soil, grabbing a 72-70 win. Will Clyburn offered up 17 points in that game while Nicolo Melli managed to chip in with a double-double in that win. Melli is the key man for the hosts, offering an average of 11.3 points per game while Darius Miller provides an average of 12.3 points per game. For the Turkish side, Brad Wanamaker has provided an average of 15.5 points per game while Clyburn has offered an average of 12.9 points per game. James Anderson, with an average of 10 points per game has also provided a great deal of support to his team and if he can chip in with points and play on Thursday evening, this may be a game where the away side celebrates at the end. Take Darussafaka Dogus Istanbul at -5 at odds of 1.90 and for the Over/Under market, look to go UNDER 157.0 which you can find at odds of 1.90. Bet Now!